Why Choose PVC membrane roof ? Quebec’s climate is a major factor governing the selection of the right membrane for your roof. Polyvinyl chloride (PVC) membranes have been a reliable choice for many decades in both Europe and here in the Americas. Initially considered a novelty, it is now mass produced year after year. The popularity of PVC is due to its solid seams, high UV reflectivity, and resistance to water, chemicals, grease, condensation and fire. These outstanding features, along with excellent price-quality ratio, make PVC one of the most widely used materials. 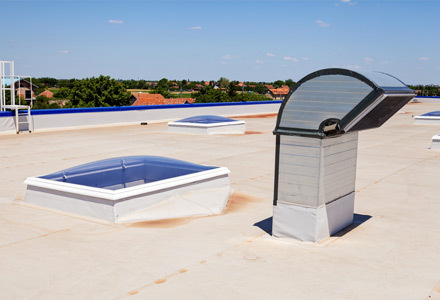 It is the most popular solution in the industry and can be installed on any type of slow-slope or flat roof. Wide temperature swings are tough on Quebec’s roofs; that is why selecting the right roofing material is crucial. PVC membranes are affordable, maintenance friendly, and extremely watertight. Toitures PME is a leader in the design and installation of this top-quality product. PVC-membrane roofs are aesthetically different, but also long lasting. They are available in a wide array of colours. To learn more about PVC roofing, contact the Toitures PME team today.